The internal processing of this module is very complex but needs to be explained once even to the average user to avoid common mistakes and to let you exploit its full functionality. First you have to understand that when Apache processes a HTTP request it does this in phases. A hook for each of these phases is provided by the Apache API. Mod_rewrite uses two of these hooks: the URL-to-filename translation hook which is used after the HTTP request has been read but before any authorization starts and the Fixup hook which is triggered after the authorization phases and after the per-directory config files (.htaccess) have been read, but before the content handler is activated. Although mod_rewrite rewrites URLs to URLs, URLs to filenames and even filenames to filenames, the API currently provides only a URL-to-filename hook. In Apache 2.0 the two missing hooks will be added to make the processing more clear. But this point has no drawbacks for the user, it is just a fact which should be remembered: Apache does more in the URL-to-filename hook than the API intends for it. Unbelievably mod_rewrite provides URL manipulations in per-directory context, i.e., within .htaccess files, although these are reached a very long time after the URLs have been translated to filenames. It has to be this way because .htaccess files live in the filesystem, so processing has already reached this stage. In other words: According to the API phases at this time it is too late for any URL manipulations. To overcome this chicken and egg problem mod_rewrite uses a trick: When you manipulate a URL/filename in per-directory context mod_rewrite first rewrites the filename back to its corresponding URL (which is usually impossible, but see the RewriteBase directive below for the trick to achieve this) and then initiates a new internal sub-request with the new URL. This restarts processing of the API phases. Again mod_rewrite tries hard to make this complicated step totally transparent to the user, but you should remember here: While URL manipulations in per-server context are really fast and efficient, per-directory rewrites are slow and inefficient due to this chicken and egg problem. But on the other hand this is the only way mod_rewrite can provide (locally restricted) URL manipulations to the average user. Don't forget these two points! As you can see, first the URL is matched against the Pattern of each rule. When it fails mod_rewrite immediately stops processing this rule and continues with the next rule. If the Pattern matches, mod_rewrite looks for corresponding rule conditions. If none are present, it just substitutes the URL with a new value which is constructed from the string Substitution and goes on with its rule-looping. But if conditions exist, it starts an inner loop for processing them in the order that they are listed. For conditions the logic is different: we don't match a pattern against the current URL. Instead we first create a string TestString by expanding variables, back-references, map lookups, etc. and then we try to match CondPattern against it. If the pattern doesn't match, the complete set of conditions and the corresponding rule fails. If the pattern matches, then the next condition is processed until no more conditions are available. 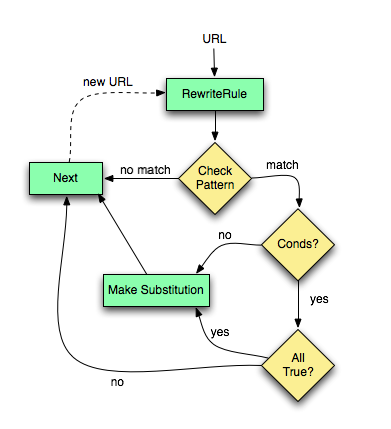 If all conditions match, processing is continued with the substitution of the URL with Substitution.